Are you sick? You’re not alone. It seems like everyone is sick in the winter time, and there are many things that can cause it. In fact, there are so many different illnesses that it can be hard to tell what you have and how to treat it. One of the most common symptoms is the sniffles, which is most commonly caused by either the flu, a cold, or allergies. How do you tell which one you are suffering from and treat it? We’ve put together this guide to help! 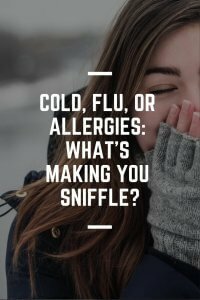 Time – Flu and cold symptoms typically appear and clear over the course of a few days, but allergic reactions occur almost immediately and can last a long time, even year-round if you’re continuously exposed to the allergen. Treatment – Flu and cold viruses have to run their course, but allergy symptoms like postnasal drip and swollen, watery, and/or itchy eyes can be improved with proper treatment. Temperature – If you have a fever, you more than likely have the flu or a cold. Allergies are not known to cause fevers. In most cases, if you have a cold or the flu, you simply have to wait it out. Stay in bed, drink plenty of clear liquids, and rest for a few days. If your symptoms don’t get better, you are unable to keep down liquids for an extended period of time, or you find it difficult to breathe, you should see a doctor for treatment. Otherwise, take it easy and let the virus run its course. You’ll be good as new in a matter of time. Allergies are very different than viruses because they do not just run their course. As long as you are exposed to the allergen, you will continue to have allergy symptoms. This means that if you don’t do anything, you might not ever see your symptoms improve. It also means, though, that you can take action and often see your allergies improve quickly, instead of having to wait like with the flu. Outdoor Allergens — There are a number of outdoor allergens, and contrary to popular belief they aren’t just found in the spring. Ragweed is very prevalent in the fall and is a huge source of what people know as hayfever this time of year. Another big outdoor allergen this time of year is mold, which loves to grow in damp, dark places. Piles of dead leaves, incorrectly stored firewood, and other places around your yard can be full of hidden mold, triggering allergies. Depending on where you live, there may also be other regional allergens you have to worry about. Indoor Allergens — The indoors is also full of potential allergens. The most common indoor allergens are dust mites and pet dander. Even homes without a pet can experience pet dander, especially if you have guests that have a pet or spend time at a home with a pet and then carry it back to your home on your clothes, shoes, and skin. Outdoor allergens such as ragweed can also be carried into your home and be the cause of indoor sneezing as well. Reduce — Reduce the amount of allergens in your air. Allergens find a way into our air by a lot of means, but a good filter can reduce the amount you breathe in. If you’re running your heater this winter, install a high-quality furnace filter with a minimum filtration rating of MERV 8 to capture airborne allergens like pollen, dust, and dander before they’re circulated throughout your home. If you’re suffering from outdoor allergens, making sure to keep your doors and windows closed as much as possible will also reduce the amount of allergens in your home. Remove — Allergens from our air, shoes, and more end up in the biggest horizontal surface in our home: our carpet. A good professional carpet cleaner will be able to remove these allergens from your home. In fact, San Juan County Chem-Dry’s Hot Carbonating Extraction (HCE) process for cleaning carpets was found to remove, on average, 98% of common household allergens, such as dog and cat dander and dust mites, from carpets and upholstery and, when a sanitizer was added, 89% of airborne bacteria. That’s a lot less germs and allergens to make your sick in your home! Relieve — It’s impossible to completely remove allergens in our homes, especially if you’re allergic to dust or your pet! Take the proactive measures above, and if you are still experiencing allergies, consider taking allergy medication to help as well. If your allergies a severe, a doctor will be able to help you find some relief. We really hope that you and your family don’t suffer the sniffles this winter, but if you do we hope this guide helps you to identify the source and get better!